Xiaomi launched two new power banks in India recently which were released under the “Made in India” campaign. The Mi Powerbank 2i comes in two variants according to the capacity; 10000 mAh and 20000 mAh. Last month, Xiaomi announced the availability of the Mi Powerbank 2i on Amazon and Flipkart. Today, the company has increased the prices of these power banks by Rs 100. The 10000mAh and 20000mAh power banks are now available for Rs. 899 and Rs 1,599 respectively. Why Xiaomi increased the price for these power banks is still not clear, there is nothing about this price hike from the company yet. The name, design, and features of the new Mi Powerbank 2i are almost similar to the previously released Mi Powerbank which also comes with the same capacity as well. The Mi Powerbank 2i comes with slightly different dimensions and design. Both of the models in Mi Powerbank 2i comes with two-way fast charging and a low power mode which can be enabled by pressing the button twice which charges the devices like the Mi band and Mi Bluetooth headset efficiently and safely. The 10000 mAh power bank 2i comes with a metal encasing for durability and the 20000 mAh power bank 2i comes with ABS plastic encasing to decrease the weight a little bit and adds a better grip. 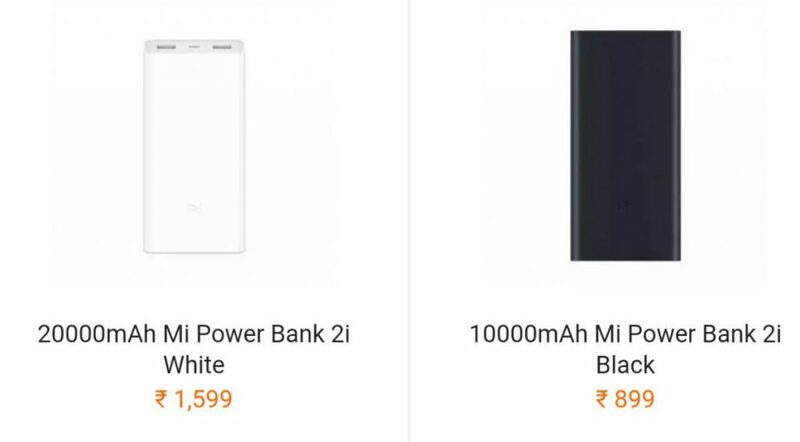 The official website of Xiaomi; Mi.com and the Amazon are selling these power banks at the new price whereas the Flipkart is still selling them at the old rates. So, if you want to buy a new powerbank then this is the right time to grab it from Flipkart.